When a vegan couple gets married, one of their biggest concerns has to be the menu for the reception. Do they go all-in and all-vegan? Even the wedding experts don’t always agree about that one. Michelle Cehn, a PETA staffer and vegan cookbook author told Martha Stewart Weddings that weddings are a great opportunity for the couple to “wow their guests” with a delicious vegan meal. But Brides magazine suggests either including one non-vegan entree to try to please omnivore invitees, or letting everyone know in advance that they’re in for an evening of nut milks and assorted grains. And The Knot gives an enthusiastic ‘yes’ to putting one non-veggie meal on the menu, especially if your meat-eating future in-laws or parents are paying for it. 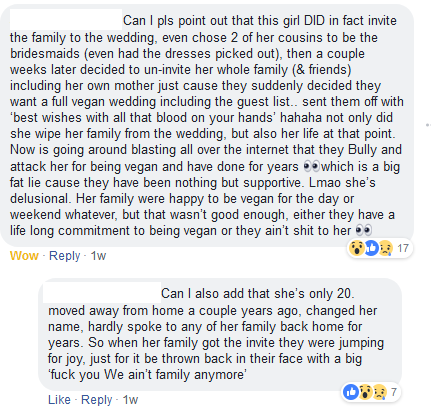 But all three publications—and literally everyone else on the planet—would probably agree that what a vegan bride-to-be shouldn’t do is un-invite her entire family by telling them that they’re murderers who are no longer welcome at her wedding. 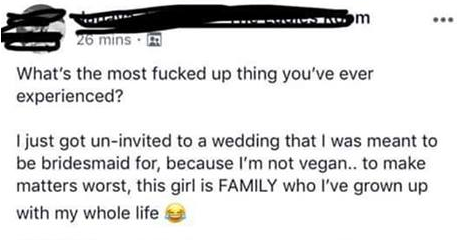 And although the bridesmaid said that the woman’s family was “happy to be vegan for the day,” it’s that ‘for the day’ part which seems to have made the bride go bonkers. 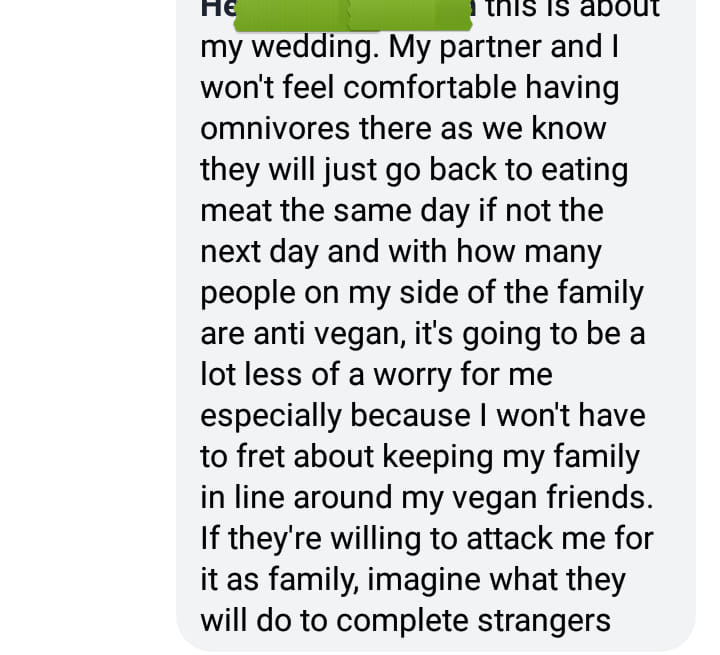 “My partner and I won’t feel comfortable having omnivores there as we know they will just go back to eating meat the same day, if not the next day,” she wrote. Another added, “$100 says she complains when the people she banned from the wedding don't get her a gift.” If any of those “murderers” still want to get her something, maybe something by Emily Post would be a good place to start.